The Atmospheric Infrared Sounder (AIRS) Level 2 Near Real Time (NRT) Standard Physical Retrieval (AIRS-only) product (AIRS2RET_NRT_006) differs from the routine product (AIRS2RET_006) in four ways to meet the three hour latency requirements of the Land Atmosphere NRT Capability Earth Observing System (LANCE): (1) The NRT granules are produced without previous or subsequent granules if those granules are not available within 5 minutes, (2) the predictive ephemeris/attitude data are used rather than the definitive ephemeris/attitude, (3) if the forecast surface pressure is unavailable, a surface climatology is used, and (4) no ice cloud properties retrievals are performed. The consequences of these differences are described in the AIRS Near Real Time (NRT) data products document. The Atmospheric Infrared Sounder (AIRS) is a grating spectrometer (R = 1200) aboard the second Earth Observing System (EOS) polar-orbiting platform, EOS Aqua. In combination with the Advanced Microwave Sounding Unit (AMSU) and the Humidity Sounder for Brazil (HSB), AIRS constitutes an innovative atmospheric sounding group of visible, infrared, and microwave sensors. This product is produced using AIRS IR only because the radiometric noise in AMSU channel 4 started to increase significantly (since June 2007). 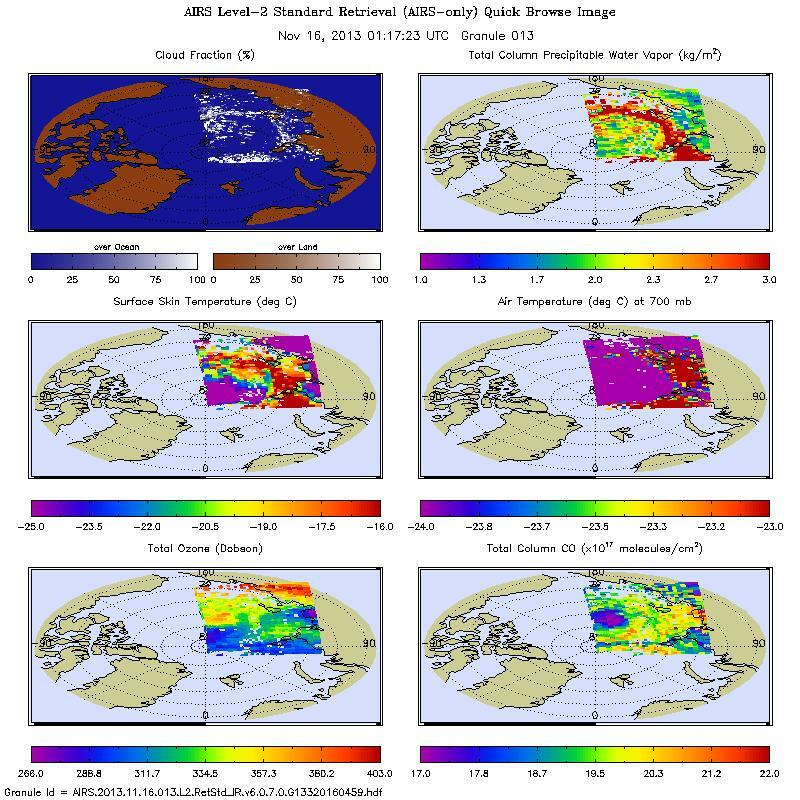 The AIRS Standard Retrieval Product consists of retrieved estimates of cloud and surface properties, plus profiles of retrieved temperature, water vapor, ozone, carbon monoxide and methane. Estimates of the errors associated with these quantities is also part of the Standard Product. The temperature profile vertical resolution is 28 levels total between 1100 mb and 0.1 mb, while moisture profile is reported at 14 atmospheric layers between 1100 mb and 50 mb. The horizontal resolution is 50 km. An AIRS granule has been set as 6 minutes of data, 30 footprints cross track by 45 lines along track. The Near Real Time (NRT) product is for users whose primary interest is the low latency for data availability. While standard data products are available within 3 days of observation, NRT data are usually available within 3 hours of observation. The product is similar to AIRX2RET except the processing uses only the AIRS channels. No AMSU information was used in the generation of this product. As a Near Real Time (NRT) product this differs from AIRS2RET.006 AIRS-only in four ways to meet the three hour latency requirement of the Land Atmosphere NRT Capability Earth Observing System (LANCE). For additional information about NRT processing see either the Related URL section or the Publication References section for the V6 NRT memo. The quality of data products, described in the associated references, provide information about numerous validation studies conducted and papers written documenting the excellence of the products using radiosondes, ground truth, other satellites, and model analysis products. There are however several limitation of the AIRS-only Version-6 retrieval products. The AIRS-only surface classification determination is not optimal in polar regions. In addition, the Version-6 retrievals contain a spurious dry daytime moisture bias. Another is the thickness of the AIRS atmospheric temperature layer structure near the surface is not sensitive enough for the determination of a consistently accurate boundary layer. For trace gases, the total column CO and total column methane (CH4) are dominated by the initial guess and should not be used for research purposes. In addition, the AIRS retrieval is not sensitive to either constituent near the surface. Also, the total column ozone is good, but the shape of the profile can be incorrect in regions of temperature inversion. Occasionally in the tropical ocean the algorithm confuses silicates from dust storms blowing off the African continent toward the Americas for high levels of ozone. Each variable contains a flag indicating the quality of the value. The three options for this quality flag are: 0 for best quality, 1 for good quality, 2 for do not use. Author(s) B. H. Kahn et al. Access the data via datacasting. AIRS home page at NASA/JPL. General information on the AIRS instrument,algorithms, and other AIRS-related activities can be found. Aqua No campaigns listed. No dates provided.